Omaha charitable giving turns on a funding wheel of corporate, foundation and individual donors of all levels. This month’s “Omaha Gives!” is a prime example of how that wheel has expanded. This city with its high concentration of millionaires, one certifiable mega-billionaire and large corporate and family foundations is widely heralded for its generosity. Omaha’s no different than any other city, though, in relying on giving to fill gaps. Philanthropy fills the gulf between what nonprofits may generate and what they get from public (government) funding sources. There are also funding conduits or facilitators. The Reader recently interviewed three local leaders from three key organizations – the Greater Omaha Chamber of Commerce, Omaha Community Foundation and United Way — intimately involved in the fabric of Omaha giving for insight into how philanthropy gets activated here. While the wheel has been turning for some time and can be credited with a lot of progress, so far intractable problems are encouraging a new approach at the highest levels. These efforts will be key in defining our future as a city. Annually, organizations seek support for ongoing needs ranging from services, programs, events and activities to operating expenses. Special needs may also arise, such as capital construction projects or larger-scale civic endeavors requiring special asks. The giving sector is starting to work more collaboratively to identify and address persistent and emerging community wide needs. Corporate, foundation, civic and other leaders have always convened to analyze and delegate where resources should go. This vetting and ranking explains why some efforts get funded and others don’t or why some programs are supported at higher levels than others. Curating simply prioritizes some things over others. Different players have their own funding missions or targets, but still join others in supporting special initiatives, campaigns or projects that require more collective impact. All these efforts measure what kind of city Omaha is. Giving shapes the physical and intangiblelandscape – from infrastructure, skyline, parks and other amenities to health, vitality, livability and compassion. Everyone now agrees that no one organization or philanthropist can make much of a difference alone. It’s in the giving power of many that real change can occur. The Greater Omaha Chamber of Commerce works with the giving community to fulfill its goals. Prosper Omaha (2014-2018) is the latest funding program for the Chamber’s economic development partnership and it’s a radical departure from previous efforts. President-CEO David Brown said, “We have a bifurcated agenda to provide services to our 3,200 business members and to figure out ways to grow and improve the community. Development and growth assumes if we can make it a better and growing community, our member firms will benefit and be able to hire more people – and there’s a great spinoff benefit from that. Examples of the Chamber’s catalytic work include working with community partners to create Careerockit, a week-long event in April that exposed 10,000-plus area students to thousands of career opportunities, and to get Omaha designated a TechHire Community, which adds the city to a national network receiving support for helping overlooked and underrepresented populations start technology careers. The Chamber also partnered to develop The Kitchen Council, a food startup incubator that gives members access to a fully-licensed commercialkitchen and other resources to lower barriers of entry and to spur entrepreneurship. When the Chamber throws its weight behind something, ripples usually happen. “We get a lot done in large measure because we collaborate with people who have the authority to get things done,” Brown said. “Our public advocacy work is really important for us to be able to cause change to happen. Frankly, the Chamber cannot pass a zoning ordinance but we can encourage other people to do so. We can’t fix roads, but we can encourage the city or state administration to do so. Our role can only be effective if we can convene people who have similar goals in mind and can figure out a path forward to solving a problem or addressing a challenge. On a big picture scale, the Chamber engages in strategic planning. Rather than focusing almost exclusively on chasing “smokestack” industries, for the first time the Chamber has engaged a futurist and really expanded its community partnerships. For being one of the most highly awarded chamber organizations in the country, it’s not resting on its laurels. Part of Ryan’s futurist work is spent with various local nonprofit boards and planning committees teaching them strategic planning tools. Key to long term thinking is capacity building, another emerging tactic being picked up by another key player in the giving landscape. 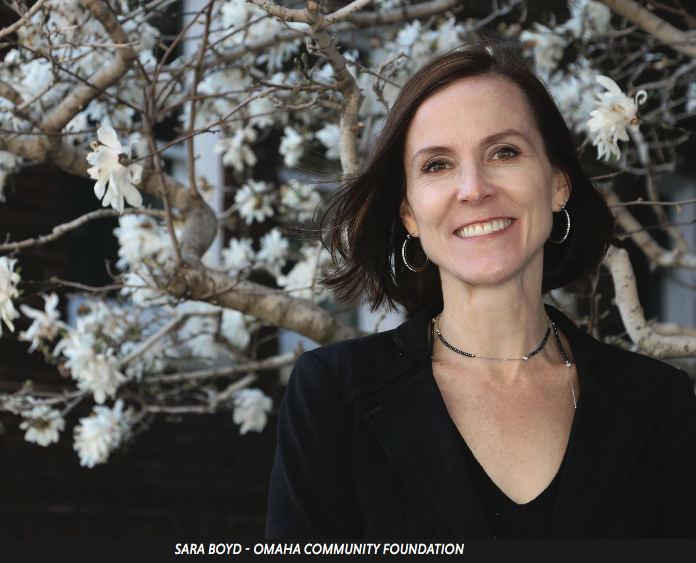 Helping nonprofits be sustainable is a focus of the Omaha Community Foundation, whose Nonprofit Capacity Building program’s 24-month curriculum is designed to strengthen organizational and leadership capacity needs. Ten area nonprofits are chosen each year to participate. Forty nine organizations have gone through the program. Currently, 20 organizations are in the program (10 in their first year and 10 in their second year). Education is a core focus of the foundation, the United Way and the Chamber. “I think education is the base for the kind of development we’re going to have to see in the future,” Brown said. “We’ve got to make sure our kids, whether the most affluent or the least affluent, whether in North Omaha, West Omaha, Council Bluffs or Sarpy County, are getting the best education they can get. We have a community with about 3 percent unemployment and yet we know there are pockets of higher unemployment. What causes that higher unemployment isn’t lack of jobs in many cases, it’s lack of preparedness, strong education or a high school diploma. Alleviating the high poverty that persists relates back to education and workforce development, Brown said. Long the leading organization in fighting poverty and funding human services, the United Way is evolving from being more of a funding conduit to an accountability organization. With so many community problems intertwined and with so many efforts yielding such little success over the years, a new approach was demanded. Meanwhile, the state’s budget deficit has cut into public education, services and programs. Possible federal cuts to arts and human services funding loom large. The resulting pilot Alliance program launches June 1. United Way also works across the community on education. “The Chamber helped us convene a group conversation with superintendents from across the community,” Forsberg said, “We took a really take a hard look at how you measure whether a kid is progressing and what not-for-profit support could assist school systems with. Forsberg said intervention can mean mentoring support, but also building awareness within school systems and families to keep kids in classrooms. OCF’s Boyd pointed to the local Adolescent Health Project, led by the Women’s Fund of Omaha, with support from her foundation and other players, as another example of “a broader focus” with more partners at the table. Input from many sources is crucial, Boyd said, but even then solutions can be elusive. North Omaha redevelopment is unfolding at an historic rate and the giving community is investing heavily there. The Chamber’s North Omaha Development Strategy spurred the North Omaha Village Revitalization Plan now being realized. Philanthropic dollars are pouring in to support efforts by the Empowerment Network, 75 North, Metro Community College and others. United Way now takes a systemic view as well. “We have been in the community for 94 years and the needs over that time have evolved,” Forsberg said. “We represent a large donor base. Part of our responsibility is to read that and have a community-wide perspective and understand where we can invest that’s really going to be meaningful. We see ourselves as convener, collaborator, information-aggregator. We really are trying to bring thought leaders in the community together to address these issues. It takes a system. That approach has recently become more formalized. That assessment led to United Way’s 2025 goals. By 2025, United Way aims to support the delivery of two million-plus services addressing basic needs of people living in or at risk of poverty through a more integrated, coordinated, precise and measurable system of basic needs supports. Forsberg said, “We pulled together task forces. Part of their focus was looking at who was doing what in these various areas. Based upon input from stakeholders and others in the community we discerned where we could make the greatest difference in supporting things like basic needs (for food, shelter). Metrics are key to the approach. “With support from the Sherwood Foundation and the Weitz Family Foundation, we’ve implemented an analytics and performance team to ensure we’re being efficient with that spend and not just looking at it from an individual program- level, but at the whole system. That’s allowed us to take best practices in analyzing whether or not the way you’re investing is driving the change you hope to make. What we’ve found is it helps programs we support improve and it gives them more of an understanding of whether the impact they hope to drive is also being accomplished. Shaping strategic community goals in partnership with givers is part of the Chamber’s mission, said Brown. Everything the Chamber does, he said, is measured. “We incorporate most of the public and private foundations executive directors and staff into all of our strategic planning processes. We’ve invited them to be involved in all of our strategic foresight work. On the futurist side, they’ve been involved in our discussions for our economic development strategy and as issues come up in the community, we find ourselves working on those projects together, too. It’s not unusual for the Chamber and several of the foundations and other nonprofit groups to sit around the table with business leaders talking about how to solve a community problem. Brown said collaboration comes with the territory, but Omaha does it to an unusual degree. “A lot of collaboration happens in this community between philanthropists and businesses and the not-for-profit world to see what projects should move forward and which ones maybe not. I think Omaha has collaboration in its DNA. I rarely see an organization stand up and say we are going to work on this project by ourselves and not seek input or not be involved in a strategic discussion about whether it has merit or not. On behalf of donors the foundation has granted $1.5 billion to nonprofits since 1982. In 2016, its donors granted $149 million. Its own Fund for Omaha granted $294,176 in 2016. As of the end of last year, the foundation’s assets number just over $1 billion. The foundation’s desire to broaden its work and better measure community needs helped lead to the birth of The Landscape project – a public, data-driven reflection of the community across six areas of community life: Health, Neighborhoods, Safety, Transportation, Workforce and Education.Those markers largely came out of the community perception or assessment study that OCF did with United Way and Iowa West Foundation. “There are likely other areas over time we will add to The Landscape,” Boyd said. Greater impact is the ultimate goal. She and her colleagues are trying to find ways to get millennials to donate. The foundation’s found success doing that through its Omaha Gives campaign. Boyd, Forsberg and Brown are aware Omaha’s legendary giving is generational. While wealth will change hands, they say local philanthropists have been mindful creating instruments to ensure future giving.